I was sent the following by email and urged to publish it. The pogrom struck at what was the most prosperous, prominent and well-integrated Jewish community in the Middle East – one whose origins went back more than 2,500 years – long before there was any Arab presence in the country. The 90,000 Jews of Baghdad, it should be said, played a major role in the commercial and professional life of the city. However, in the 1930s they already found themselves confronted by an increasingly virulent anti-Semitic and anti-Zionist propaganda in the Iraqi press and among nationalist political groups. This agitation treated the intensely patriotic Iraqi Jews as an alien, hostile minority who had to be ejected from all the social, economic and political positions it held in the Iraqi state. Iraqi Arab nationalists, like their counterparts in Syria, Lebanon, Palestine and Egypt, had been much influenced in the 1930s by the rise of Nazi Germany. Hitler’s National Socialism attracted them as a spectacular, authoritarian model for achieving Iraqi national unity and a wider union of Arabs in the region. It was no accident that the pro-German ideologue of pan-Arabism, Sati al-Husri, exerted a major influence on Iraqi education after arriving in Baghdad in 1921, or that Michel Aflaq, the chief theoretician of the Iraqi and Syrian Ba’athists had also absorbed German national-socialist ideas while studying in Paris between 1928-1932. The Director General of the Iraqi Ministry of Education in the 1930s, Dr. Sami Shawkat, was another fanatical ideologue, especially active in instilling a military spirit (resembling the German Nazi model) in Iraqi youth. He also developed radically anti-Jewish ideas which were heavily indebted to Nazi anti-Semitism. In a book published in Baghdad in 1939, These Are Our Aims, Shawkat openly called for the annihilation of the Jews in Iraq, as a necessary prerequisite for achieving an Iraqi national revival and fulfilling the country’s ”historical mission” of uniting the Arab nation. Significantly, it was also in Baghdad that the first official Arabic translations of parts of Hitler’s Mein Kampf appeared in 1934. In order not to offend Arab sensibilities the final translation “edited” out Hitler’s racial theories about inferior “Semites” – making it clear that anti-Semitism related only to Jews, not to Arabs. The Iraqi translator of Hitler’s “magnum opus” was Yūnus al-Sab’āwī, a young Nazi enthusiast and extreme anti-Semite. A close confidant of nationalist officers in the Iraqi army, Al-Sab’āwī came to play an important role in Iraqi politics. From April to June 1941 he even served as Iraqi Minister of Economics. Al-Sab’āwī was indeed one of the architects of the Farhūd in which his anti-Semitic para-military youth group also took part. Al-Sab’āwī had earlier established a close connection with Nazi Germany’s Ambassador to Iraq in the late 1930s, Dr. Fritz Grobba. The latter was a distinguished Orientalist (fluent in Arabic, Persian and Turkish) who eventually convinced Hitler that helping Arab nationalists to throw off British control of Iraq should be part of German strategy. Grobba also contributed much through the networks he had established in Iraq, towards spreading the idea that Iraqi Jews were a “fifth column” of Great Britain – sworn enemies of Germany and of the Arab nation. Equally, Palestinian nationalists, led by the Mufti of Jerusalem, Haj Amin al-Husseini (who had had fled to Baghdad in the late 1930s), conducted an especially vicious campaign to incite a jihad among the local Arab population against Great Britain, Zionism and the Jews of Iraq. The Mufti – a close ally of Hitler during the four years he spent in Berlin between 1941 and 1945 – would also exert a particularly toxic influence on the pro-Nazi politician Rashid Ali al-Kailani, whose successful anti-British coup had forced the unpopular Hashemite Regent Abd al-Ilāh to flee the country. The coup brought to power on April 1, 1941 some of the most rabid Jew-baiters in Iraq. Anti-British and anti-Semitic propaganda now reached a zenith that greatly contributed to the violence that burst forth two months later. 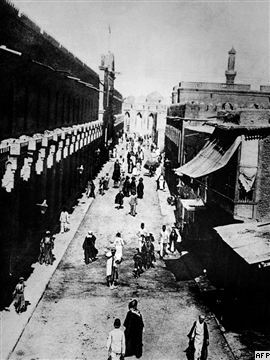 Ironically enough, it was the decisive victory of the British and the return of the Regent on June 1 that immediately provoked the pogrom, an act of unparalleled revenge by the Muslim masses against the Jews of Baghdad that expressed their deep disappointment at the fall of the popular Rashid Ali regime. The British Army, now encamped on the outskirts of Baghdad, could easily have intervened but it chose not to do so, dubiously claiming this would have damaged the prestige of the (pro-British) Regent in the eyes of his own people. The British behaved in a similar fashion on several occasions in Mandatory Palestine, in Libya (November 1945) and in Aden (December 1945) – standing by as Arab mobs killed defenseless Jews. In fact, for most Iraqi Muslims in 1941, the British were perceived as oppressive colonizers, the Jews as their “agents” and the German Nazis as “anti-imperialist” saviors! But German military assistance, when it finally came, was too little and too late to save the Rashid Ali regime. The Farhūd has been incomprehensibly ignored or downplayed both in Zionist historiography and even more in general histories of the Middle East. Arab historians have been silent or else falsified the facts and there are even Israeli and Jewish writers who have unconvincingly tried to dismiss its importance. Yet this traumatic event was indeed of seminal importance. It proved beyond reasonable doubt the strength of Arab nationalist anti-Semitism and of Nazi-style incitement on a Muslim population that had come to see in its patriotic Jewish minority “the enemy within.” The Jews of Iraq, seventy years ago, suddenly found themselves in the crossfire of three converging forms of murderous anti-Semitism – that of the German Nazis, the Palestinian exiles in Baghdad led by Amin el-Husseini, and Iraqi pan-Arab nationalists. Ten years later, the government of Iraq under the pro-British Nuri es-Said, expropriated, dispossessed, disenfranchised and brought about the forced emigration of nearly 120,000 Iraqi Jews, thereby cruelly terminating the oldest of all Diaspora histories. This was not only a crime against humanity but an insufficiently acknowledged part of the history of the Holocaust. The Farhūd exposed with shocking clarity just how vulnerable the Jews in Arab lands really were and what their fate was likely to be under any decolonized Arab regime in the future, especially if there was a breakdown of law and order. Prof. Robert S. Wistrich is the director of The Vidal Sassoon International Center for the Study of Anti-Semitism at the Hebrew University of Jerusalem (http://sicsa.huji.ac.il/) and the author of A Lethal Obsession: Anti-Semitism from Antiquity to the Global Jihad (Random House, January 2010). This article is a condensed version of a recent lecture on the 1941 pogrom in Baghdad hosted by the Center in Jerusalem. Video now in English: Who owns the territories? A stronger case for annexing Judea and Samaria?